Find the nearest public restroom when you really need to go! Picture this: You're happily strolling through the commercial district of a metropolitan area when you're suddenly hit with the urge to use the restroom. You look around, but all you see are shops and public areas. You don't want to barge into some place only to use their facilities to relieve yourself. That's when restroomFinder swoops in and saves the day. 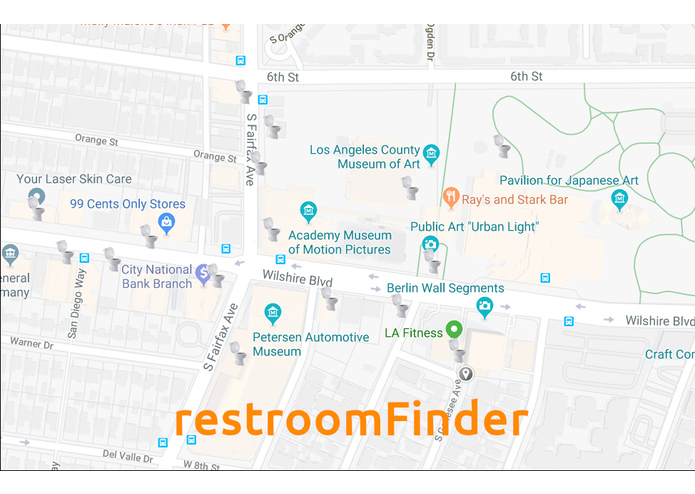 restroomFinder takes your current location and pinpoints the restroom locations around you as markers on Google Maps. We used Android Studio to create the Android application. We then used Google Maps and Location APIs to retrieve the current location of the user and plot it on Google Maps. Moreover, we used Firebase to store the locations, descriptions, and ratings of restrooms/public facilities. This choice facilitates easy access to the data, allowing for quick plotting of restroom locations on Google Maps. None of the team members had prior experience using Android Studio or developing android/mobile applications. In addition, we had little to no experience in dealing with complex APIs, especially with Google Maps and Location APIs. Even with our minimal knowledge, we were able to whip up something useful while learning throughout the entire experience. I was especially proud of my team because we worked together to split up the work and each learn a different aspect that was needed for the final product. What's next for the future of "toiletsourcing"?